A New Star is on the Horizon – the Marlow Voyager 76LR and her soon to be announced sister ships in larger and smaller versions. Marlow Yachts has introduced a new series of yachts rendering today’s slow and heavy displacement cruisers obsolete in form, function, capability, internal volume and style. This new line with extreme range and capability will compliment the very successful Marlow Explorer lineup, though having slightly lower speed potential. Boasting nearly seven feet of headroom in her voluminous machinery spaces with an overall height of just over 18’6” to the top of the Command Bridge and a draft of just 5’ the new Voyager from Marlow is able to cruise inland through the Great Loop or non-stop from San Diego to Tahiti. The command bridge has a two seat helm station with an easily accessible array of electronic navigation equipment and controls. A large, comfortable lounge and table easily accommodate friends and family with a refrigerator/icemaker, sink and storage cabinets for snacks underway. The day head, while convenient, is not obvious in its location. The upper deck is equipped with dual davits for lifting the two dinghys and can double as stabilizing mechanisms requiring no power. The main deck features a spacious saloon with curved glass front cabinets containing the audio equipment and wet bar; a hidden flat panel TV that can be raised for excellent viewing from any seat; a well appointed u-shaped galley with top of the line appliances; a spectacular master stateroom forward up three steps with a view of the stars at night and a vista of the sea by day; master head is of natural stone using onyx and granite for a stunning effect. 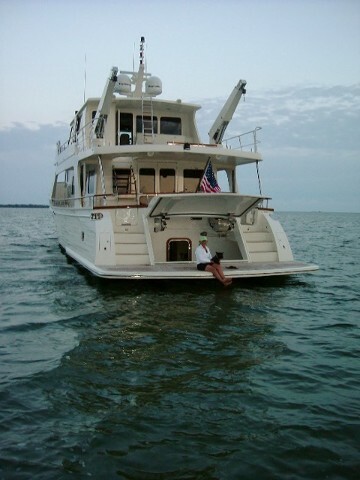 The lower deck features four staterooms, one with twin beds, one with upper and lower berths sharing a head, the VIP with a king bed and private head and a large second king master with private head. A galley area in the companionway allows guests to prepare coffee or a snack without going to the main deck. There is a large comfortable crew quarters with microwave, refrigerator/icemaker, table and lounge and full head. Aft of this is the "toy" storage area accessed by a large hydraulic door. Useable onboard volume is as much as 30% greater than today’s offshore cruisers yet overall height is typically 15-25% lower. This results in form stability that is unequaled. This radically improved form stability allows modest stabilization equipment to perform in a far superior manner to the overtaxed systems required to dampen heavy rolling so prevalent in today’s typical rounded bottom, slow displacement cruiser. At anchor, comfort is assured by the same enhanced form stability. For those rough Caribbean anchorages a proprietary and redundant passive stabilization system takes over and provides over 50% greater stability and resistance to rolling, without need for electrical or diesel power. The use of solar panels takes advantage of the suns power and reduces the overall generator use.